The design on the stamp issued in 1916 by the Hejaz, which later became Saudi Arabia, features a portion of the first page of the Koran of the Mamluk Sultan al Nasir ibn Barquq (1389-1412), which is preserved in the Museum of Arabic Art in Cairo, Egypt. This Koran dates from 1411; the lettering is Kufic, a decorative Arabic script. Mehmed Pasha Sokolovic was born in Visegrad in 1505 of Serbian parents; he was named Bajica Sokolovic. He converted to Islam and from 1564 to 1579 he was Grand Vizier of the Ottoman Empire. On the other hand, he built a church for his brother, an Orthodox priest. 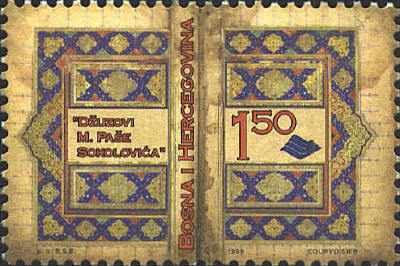 The stamp of Bosnia and Herzegovina commemorates the 420th anniversary of Dzužovi Mehmed Paša Sokolovića’s death with the cover of a manuscript Koran. No date for the cover is given.